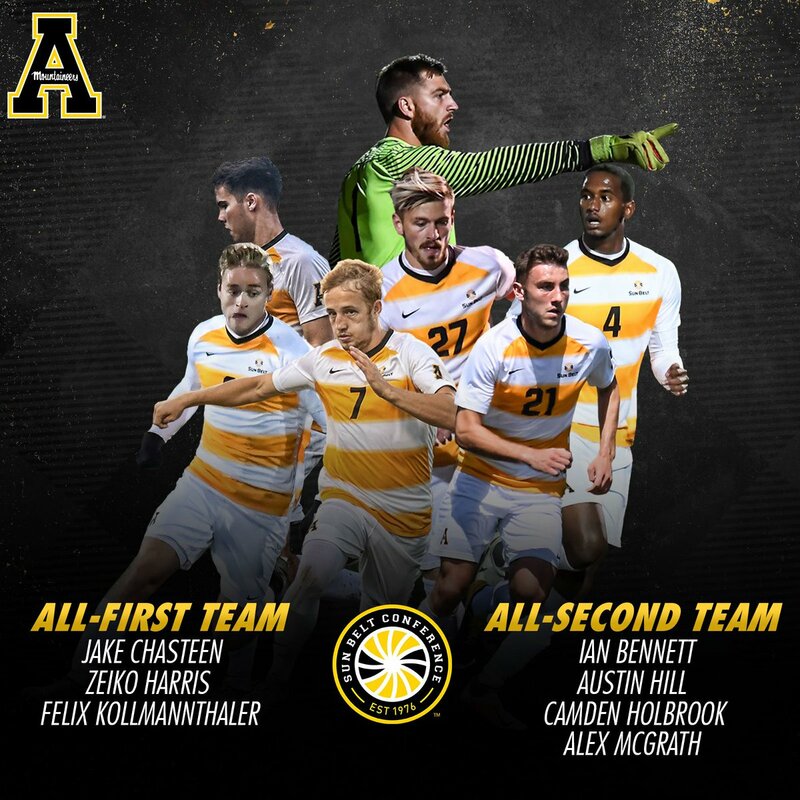 NEW ORLEANS - Highlighted by Appalachian State University men's soccer goalkeeper Jake Chasteen being named Co-Sun Belt Player of the Year, seven Mountaineers were named All-Sun Belt, as the league office announced postseason awards on Tuesday. Appalachian landed the most players on the All-Sun Belt awards list, while the seven Mountaineers are the highest that have made an all-conference team since 1980 when the Black and Gold tabbed seven student-athletes on the All-SoCon squad. where they are being honored." Three players in Jake Chasteen, Zeiko Harris and Felix Kollmannthaler were named all-first team, while Ian Bennett, Alex McGrath, Austin Hill, and Camden Holbrook were tabbed as all-second team members. All seven players helped Appalachian secure its first winning season since 2012, its first winning Sun Belt record since joining the league in 2014, a third-place finish and a bye in the opening round of the Sun Belt Championship Tournament in Statesboro. All seven athletes are receiving postseason conference recognition for the first time in their respective careers. Along with being an all-first team selection, Chasteen is the first Mountaineer since 1989 (Carlos Lee) to earn a conference player of the year award and shares the honor with Georgia Southern's Javier Carbonell. The Blowing Rock native is well deserving of the high praise, as he proved to be the best goalkeeper in the Sun Belt. Chasteen was first in the Sun Belt in goals-against average (.715), first in save percentage (.789) and first in shutouts with seven. He is 23rd in the nation in GAA, 40th in save percentage and 17th in clean sheets. His seven shutouts are tied for the second most in a single season in program history. Zeiko Harris and Felix Kollmannthaler played pivotal roles on defense, allowing the league's fewest goals at 12 and posting seven shutouts. It's the most shutouts the Apps have recorded since 2011. Harris is also tied for third with a personal-high two goals, which both came in a 3-0 win at George Mason. The sophomore was named the Sun Belt's Offensive Athlete of the Week for the first time in his career. Kollmannthaler tallied his lone assist to Harris in the victory against the Patriots. Holbrook made a splash in his first collegiate season, scoring a team-high six goals with one assist for a team-best 13 points. The Cary, N.C., was third in goals and fourth in points, which also led all freshmen in the league. His three game-winning scores were tied for second and the most by first-year players. He is one of two players and the only freshman in the conference to net a hat-trick, coming in a 3-2 win in the season opener at Jacksonville. His four goals and one assist through two contests that weekend led to a Sun Belt Offensive Athlete of the Week award and garnered national recognition with the United Soccer Coaches National Player of the Week honor. Having his best season in a Black and Gold uniform, Bennett is tied for second on the team with personal highs in goals (3) and assists (2), equaling a career-best eight points. The Wilmington, N.C., native is the only player on the team to register multiple goals and assists. Bennett is tied for ninth in the Sun Belt in goals and 10th in points. Earlier this season, he tallied scores in back-to-back contests while against Belmont, he notched his first-career game with one goal and one assist. CCU, 2-1, for its first win over a ranked opponent since 2009. McGrath has come on strong for the Mountaineers down the stretch with 10 starts in the past 12 contests. The freshman has been part of the resurgence for the Black and Gold. He has 1 shot on goal and 12 shot attempts. Appalachian will face No. 2 seed Georgia Southern on Friday at 7 p.m. on ESPN+ for a trip to its first conference tournament championship match since the SoCon Tournament in 2000.